HUGE ANNOUNCEMENT: C-17 Demo Coming to 2018 Niagara Air Show! Home > HUGE ANNOUNCEMENT: C-17 Demo Coming to 2018 Niagara Air Show! 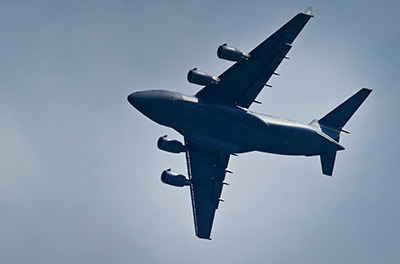 Come see the C-17 Globemaster III Tactical Flying Demonstration at this year’s Thunder of Niagara International Air Show on June 9 & 10 at the Niagara Falls Air Reserve Station! This one-of-a-kind demo comes courtesy of the 105th Airlift Wing of the New York Air National Guard, based out of Stewart Air National Guard Base in Newburgh, New York. Niagara is proud to be one of the few North American Air Shows to host this astounding aerial demonstration. “Crank and Bank” … 250,000+ Pounds in the Sky! It’s difficult to sum up the C-17 in just word and pictures. In short, the C-17 demo team will redefine “Crank & Bank” as they move 250,000+ pounds of airplane across the skies of Niagara. Heck, even fighter pilots are left slack-jawed by the C-17’s maneuverability. One the highlights of the C-17 Demonstration is its’ ridiculously short stopping distance. 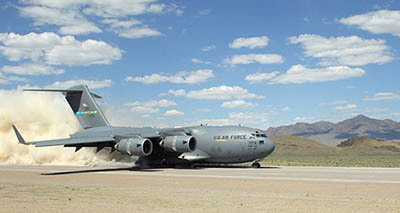 Add in the Globemaster’s ability high-speed taxi backward (in some cases, up to 65+ miles an hour – in reverse) and you’ve got a must-see demo! Remember, the only place to see this is at the air show! The ultimate measure of airlift effectiveness is the ability to rapidly project and sustain an effective combat force close to a potential battle area. Threats to U.S. interests have changed in recent years, and the size and weight of U.S.-mechanized firepower and equipment have grown in response to improved capabilities of potential adversaries. 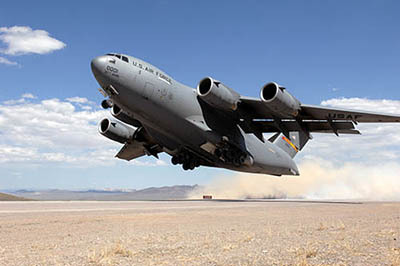 This trend has significantly increased air mobility requirements, particularly in the area of large or heavy outsize cargo. 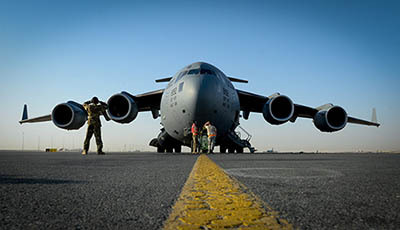 As a result, newer and more flexible airlift aircraft are needed to meet potential armed contingencies, peacekeeping or humanitarian missions worldwide. The C-17 is capable of meeting today’s demanding airlift missions.” Again, this is one you don’t want to miss!